Nuclear Energy – Niowave Inc.
To support experimentation and demonstration with novel fuels and materials for next generation reactors, Niowave is developing a subcritical testbed using a hybrid fast/thermal core configuration, coupled to an electron linac driven, that provides a fast reactor-like environment with 1015 n/cm2 fast flux level for fast neutron irradiation tests. The 1015 n/cm2 fast flux level will provide the essential high material-damage rate of 20 dpa/yr. The fast region consists of >100 cm3 to provide sufficient volume for testing advanced nuclear reactor materials (i.e., fuel, cladding, structure, etc.). This facility will be used to characterize and examine novel fuels and materials, test instruments and components, evaluate reactor safety designs, provide data for reactor code development, and support the regulatory process for licensing novel technology. A scaled-down version of this system was designed, licensed, and constructed in-house with collaboration efforts from Los Alamos National Laboratory and University of Michigan. The system is currently operational at low-power performing reactor physics experiments. Additionally, Niowave’s Radioisotope Program had established both the infrastructure and the NRC license to operate a subcritical uranium target assembly (UTA), distribute radioisotopes, and reprocess nuclear fuel. This led to the establishment of a demonstration-scale closed-loop full-recycling fuel cycle using batch-mode and small quantities of uranium. As a result, Niowave is expanding its nuclear fuel reprocessing facility to enable the DOE Fuel Cycle Technologies program to conduct science-based, engineering-driven R&D for full-recycling scheme and other sustainable nuclear fuel cycle options, to develop advanced separation techniques to lower proliferation risk, and to prototype new disposal forms to capture and immobilize nuclear waste. 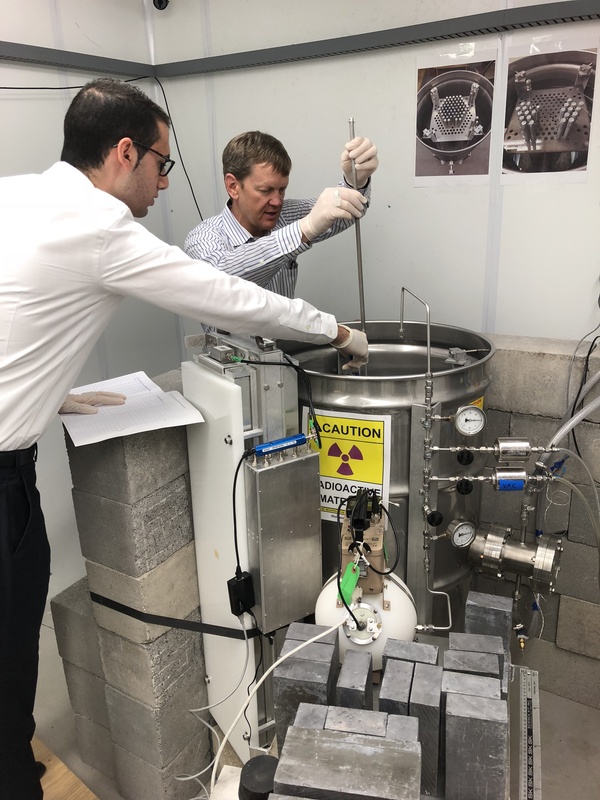 Finally, Niowave is operating a Corrosion Test Station (CTS) using liquid lead-bismuth eutectic (LBE) to endorse the development of advanced nuclear reactor fuels and materials that are capable of withstanding high-temperature, high-corrosion, and high-radiation environments. The station will operate at LBE temperature up to 700 °C with peak flow velocities capable of exceeding 5 m/s. Advanced bimetallic structures and high-purity LBE are used in this station. In addition to material corrosion/erosion research, the CTS will support work in other research areas such as thermal-hydraulics, instrumentation and controls, and chemistry.